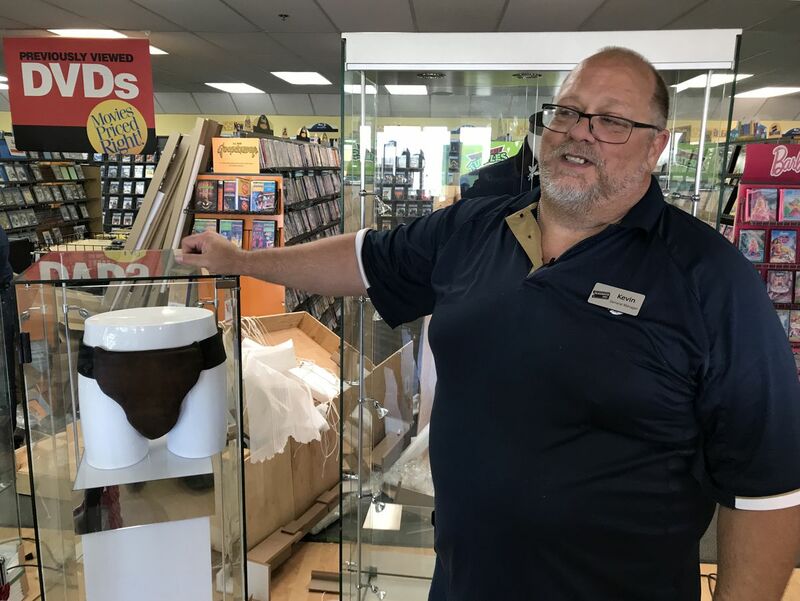 Enclosed in a locked glass case, a leather groin protector worn by Russell Crowe in the 2005 film "Cinderella Man" now belongs to Anchorage's last Blockbuster video store. The gift from HBO talk show host John Oliver arrived recently along with a collection of other Crowe movie memorabilia. Employees and customers are in on the joke and playing along. "There it is," general manager Kevin Daymude said Wednesday as he arranged the display, referring to the jockstrap as the "crown jewel." "Everybody's going to want to see it. Everybody's going to want to know it." On Wednesday afternoon, Daymude was setting up tall glass cases with Crowe artifacts courtesy of Oliver's show, "Last Week Tonight." Along with the jockstrap, the Blockbuster was also gifted a vest Crowe wore in 2012's "Les Miserables," a robe and boxing shorts also from "Cinderella Man," a hood from 2010's "Robin Hood" and both Crowe and Denzel Washington's set chairs from 2007's Oscar-nominated "American Gangster." But the most talked-about item, Daymude said, is undoubtedly the jockstrap worn by Crowe during the filming of "Cinderella Man." "We have all this memorabilia and the only thing (people) care about is the leather jockstrap," he said. On the April 15 episode of "Last Week Tonight," Oliver featured a nearly 5-minute segment about Alaska's three remaining Blockbuster stores. The spot culminates in the unveiling of memorabilia purchased for the Anchorage shop, which Oliver suggests could be used to draw people into the store. The jockstrap — sold at an auction Crowe had arranged to celebrate his divorce — went for $7,000. "I did not know this was going to happen. I had no idea," Daymude said Wednesday. Daymude initially didn't see the episode. On the same evening it aired, he checked the DeBarr Blockbuster's Facebook page and saw it had received 51 direct messages. "I was like, 'What is going on here?' " Daymude said. He later watched the segment. The shop was given 48 hours to contact "Last Week Tonight" to claim the memorabilia. "It was crazy," Daymude said of his attempts to make contact with the show's producers. "You wouldn't believe how many phone calls I got from people trying to help us get a hold of these guys." Eventually, a man from Wisconsin said his cousin worked at HBO and gave Daymude a number for the front office, Daymude said. Even then, Daymude didn't really think the memorabilia would wind up at his store. "I figured we'd get pictures, or something like that," Daymude said. When asked by a reporter if he was planning to have a "jockstrap grand opening," Daymude laughed. "I never thought of that," he said. The memorabilia will be displayed near the front of the store. "As soon as you walk in, you'll see it," Daymude said. And no, you can't try it on. "People call up and say, 'If we gave you $20, can I get a picture of myself in the jockstrap?' " Daymude said.